Product prices and availability are accurate as of 2019-03-22 17:46:43 GMT and are subject to change. Any price and availability information displayed on http://www.amazon.co.uk/ at the time of purchase will apply to the purchase of this product. This is brand new Self Heating Pet Pads rug is uniquely designed to reflect your pets body heat back towards them, helping them keep warm when it gets cold especially good for arthritic pets. Self Heating Pet Pads rug can be used directly on the floor or placed inside a pet bed, can also be used outside or in the car. 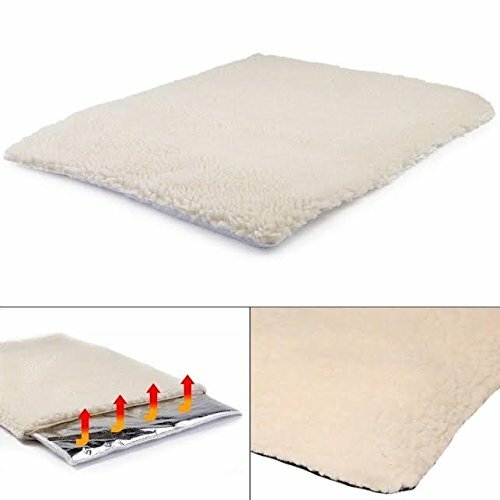 Self Heating Pet Pads rug has a heat reflective thermal insert that can be removed before machine washing, Also has has a rubber smart grip base to prevent it slipping.